All games in tagged with "Pac Attack"
Pac-Attack (パックアタック? ), known in some Japanese and European releases as Pac-Panic, is a puzzle game in the vein of Columns and Dr. Mario. It was adapted from Cosmo Gang the Puzzle, an arcade game released in the previous year.Released by Namco, it features Pac-Man as the main playing pieces, with the Ghosts and blocks as obstacles. The game was initially published in 1993 for the Sega Mega Drive/Genesis and Super NES. Game Gear and Game Boy versions followed in 1994. The Game Boy and Game Boy Color releases also feature a Super Game Boy enhanced color palette. Although Cosmo Gang the Puzzle was released to the arcades, there was never an arcade version of Pac-Attack. 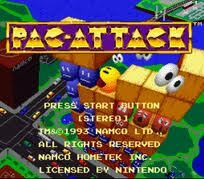 The game was also known as 'Pac-Man: Pac-Attack' and 'Pac-Panic'.